There must be something very funny about a group of people on a curving wrought iron staircase, because these two cards tickle our funny bone. The tuxedoed Waiters (1926) with champagne buckets in hand, send their “Cheers” for the new year. 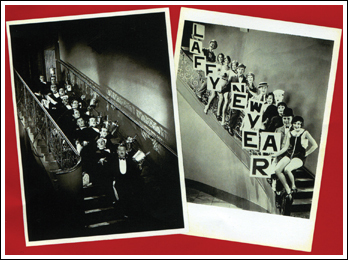 The chorus boys and girls (1930) (blank inside), wish you a Laffy New Year. Black and white cards (5” X 7” come 12 to a box.